VanCraft rental Sprinter camper vans come with economic diesel drivetrains, huge off-grid solar systems and spacious professionally converted living spaces. Inside you’ll find a comfortable full size sleeping area, kitchen space, seating, charging ports for all your devices, an outdoor shower, and tons of well organized storage. 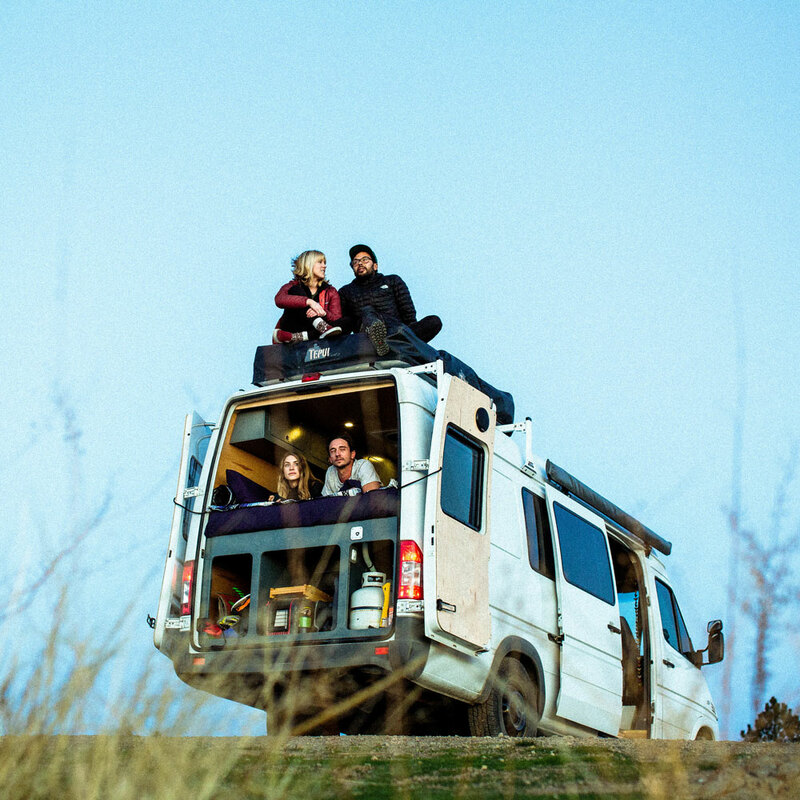 #VANLIFE is about freedom the of the open road. We include free unlimited miles with every rental booking. Every rental comes stocked with all the gear you’ll need, A full list of whats included is on our “rent” page. Our off-grid power system includes large solar panels and batteries standard. Power all your devices and on-board equipment effortlessly. VanCraft rental rates are based on a tiered pricing model. Your daily rental rate is determined by the length of your rental period; longer trips are eligible for a greater daily discount than short trips. DO YOU OFFER ONE WAY RENTALS? We do not offer one-way rentals at this time. CAN I PARK MY CAR AT VANCRAFT WHILE ON MY TRIP? Yes you can – we offer free parking for one vehicle per booking. IS THERE A MINIMUM NUMBER OF DAYS FOR RENTALS? Yes, we have a three day minimum for van reservations. WILL I BE CHARGED FOR MILEAGE? No! One of our biggest perks is that we offer unlimited miles with every rental. ARE THERE ANY HIDDEN CHARGES OR RATES? No, all charges to you will be clearly defined and outlined during the checkout process. WHERE CAN I PICK UP MY VAN? Currently, our only pickup and drop-off depot is in Oceanside, CA. THE DATES I WANT TO BOOK ARE NOT AVAILABLE, NOW WHAT? Keep in touch with us! You never know if there has been a cancellation or another van has been added to the fleet. We do! Check out our “BUY A VAN” page for availability. CAN I TAKE MY RENTAL OUT OF THE COUNTRY? You can! We offer rentals to Canada and Mexico. All renters traveling to Mexico must buy travel insurance—please CONTACT US for details. Yes, dogs are allowed free of charge. Please keep in mind that an extra cleaning fee will be charged if you do not clean up after your doggo, and that you are responsible for all damage to the van. I WANT TO RENT A VAN, BUT DON'T KNOW WHERE TO GO WITH IT, ANY SUGGESTIONS? CONTACT US! We have a ton of great trip ideas to get you on the road! Cancellations up to 7 days prior to pick up date will receive 80% refund if rental has been paid in full or forfeit of deposit whichever is greater. Within 7 days of pick up date, cancellations will receive 50% refund. Reservations may be rescheduled at no charge up to 14 days prior to pick up date and then a 20% reservation change fee will be incurred after that. There is no cancellation or option to reschedule reservation once pick up date has arrived. I'M FLYING IN, HOW DO I GET TO VANCRAFT? There are two reliable means of public transport to get you to our rental Depot. Our first recommendation is by train, give us a heads up and we will pick you up at the Oceanside train station free of charge, schedules can be found HERE. The next is via Uber or Lyft – both have fast pickup times in the greater San Diego and LA area. ARE YOUR VANS MANUAL OR AUTOMATIC? All of our vans are automatic. Most everything you need to be comfortable is stocked in the van. All you’ll need are toiletries, and to stock the fridge with your favorite foods before hitting the road. DO THE VANS HAVE A BATHROOM? Our vans come with an energy efficient, hot-water, outdoor shower with 20 gallon water storage. There is no toilet of any kind in our camper vans. IS THERE HEAT AND A/C IN THE VANS? All of our vans have A/C via the factory Mercedes dashboard HVAC system. Heat is provided by ESPAR auxiliary heat, propane heater, or both. HOW MANY PEOPLE FIT IN THE VAN? Our Long van seats 6 and our Short van seats 4. DO YOUR VANS HAVE A TOW HITCH? All of our vans have a standard tow hitch but are not set up to tow trailers; the hitch is for the use of a bike rack only. Anywhere! We encourage you to get out and explore beyond the camp grounds, using resources like the i-Overlander app to find free camping. Please be courteous to others, and pay attention to street parking signs when parking overnight; you are responsible for parking violations while the van is in your possession. We use a the famous T1N sprinter as a base platform for our rental vans. All of these vans where only offered in 2×4 in the united states. They are rear wheel drive. We do add taller than standard off-road tires, the vans do excellent off road and in snow. HOW OLD ARE YOUR CAMPERVANS? All of our vans where manufactured between 2003 and 2006, and converted here at VanCraft HQ in 2017-18. In the event of mechanical issues, please contact VanCraft immediately and let us know the situation. We do offer roadside assistance as an additional option. Our goal is to get you back on the road as soon as possible. However, if your vehicle is unavailable overnight due to being held at a repair shop, that night’s rental fee will be refunded. The origin of VanCraft is a story of two serendipitous dreams becoming reality. Nathan Doody had a dream of converting a van and driving it out west to start a new chapter of his life. Since he was a carpenter by trade, Nathan was able to custom-build his van then set out across the United States from Maine to California, hitting iconic spots along the way on an epic road trip. When he reached California, he decided to set down roots in the beach city of Oceanside and sell the van. As luck would have it, Derek Mason was looking for an escape from his 9-5 corporate life and wanted to buy a van to travel south to Central America. Derek found Nate’s listing and one grand adventure became another. Derek drove for a year, making his way to El Salvador and back. When he returned, having just experienced the trip of a lifetime, the idea of going back to a corporate job was not a soul-fulfilling option. After much thought, Derek decided he wanted to share his passion for traveling in a sustainable and authentic way with others. He contacted Nate, and the two of them got to work on creating what is now VanCraft. Our mission is to provide travelers and adventure seekers with a reliable and comfortable vessel in which to pursue their dreams.